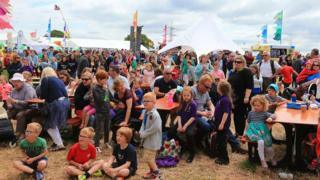 Image caption More than 90,000 people attended last year's Urdd Eisteddfod. There are warnings it could be "a problem" for visitors to the Urdd Eisteddfod to find accommodation this year as it clashes with the Champions League final. World football's biggest club game will be played in Cardiff on 3 June - the last weekend of the youth festival, which is in Bridgend this year. One B&B owner said football fans were now booking rooms outside the capital. The festival director said more caravan and tent spaces would be available. Huw Tudur, from Mair's B&B in Bridgend, said many people visiting for the Champions League were looking for rooms outside Cardiff and accommodation providers were collaborating as a result. "We are working together," he said. "Rooms overlap, or there might be double bookings, and we are sharing this information, but other places are currently full as well. "People have looked beyond Cardiff - and not only because of cost - you will naturally pay more in the capital, but there are no beds available." Mr Tudur added: "It is very tight at the moment. It's going to be a problem. I think that people need to book or make enquiries now. "It is a busy industrial area anyway - you're on the M4 corridor - and there are only a few places able to take big parties." More than 90,000 people attended last year's Urdd Eisteddfod. Festival director Aled Sion said: "We are providing more spaces than usual for caravans and tents this year - there are spaces still available. "What happens with the Urdd Eisteddfod is that people look for accommodation across a wider area, as happened in Swansea in 2011, and right along the M4, with visitors and competitors staying much further west than the Maes. "We would encourage people to look to the west rather than the east for accommodation."